Posted March 28th, 2011 by Hoffy Cycles. Your bike is your ticket to freedom. Whether you cycle purely for pleasure, or as your main mode of transport, it has the ability to take you places you have never been. Here at Hoffy Cycles we understand how important your bike is to you, which is why we offer a fantastic service and repair facility for your Brisbane bike to ensure it is kept at the top of its game all the time, getting you from A to B safely. 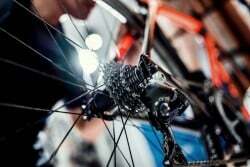 We are the best bike mechanics in Brisbane, specialising in getting performance bikes ready to race. It is because of this, that we are able to guarantee your bike will be in a far superior state upon collection. We take the time to listen to your individual needs as a rider and configure your bike to match. Our experienced mechanics know what it takes to repair your bike to ensure optimal performance. In addition to our vast knowledge of performance bikes we also have an extensive understanding of all bikes, so no matter what, you can trust our expertise to give a thorough and professional service for bike repairs. It can be tempting to try and fix the problem yourself if you find your bike needs to be repaired. However, as we all know, this can often lead to making the problem worse, and in some cases more costly. Avoid disappointment and bring your bike to us for an affordable, quality repair job. Just as you would service a car, there are recommended time periods for servicing your bike to ensure you get the best out of it. For regular riders, road bikes and racers, we recommend a service at least every 6 months and for weekend riders, every 12 months. For a trusted and professional service for your bike in Brisbane, choose Hoffy Cycles for your next bike service and repair. We are fully qualified mechanics so you can rely on us for only the best in quality. Servicing your bike will significantly reduce wear and tear over time and enhance its current performance. If you love your bike then we love to make it the best it can be. For al your bike repairs and maintenance needs, get in touch with Hoffy Cycles today!